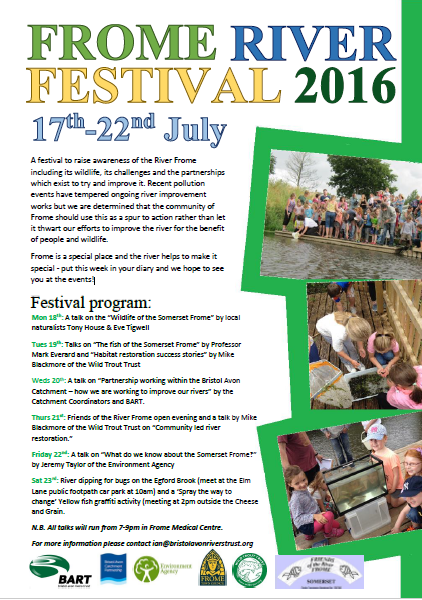 BART has joined forces with a number of local organisations to put on Frome River Awareness Festival 2016, a series of events to raise awareness of the River Frome including its wildlife, its challenges and the partnerships which exist to try and improve it. Recent pollution events have tempered ongoing river improvement works but we are determined that the community of Frome should use this as a spur to action rather than let it thwart our efforts to improve the river for the benefit of people and wildlife. Frome is a special place and the river helps to make it special – put this week in your diary and we hope to see you at the events!